Here is a nice attacking game by GM Boros(HUN) from the PAN-AM Intercollegiate Championships. The plan is clearly to attack but how? 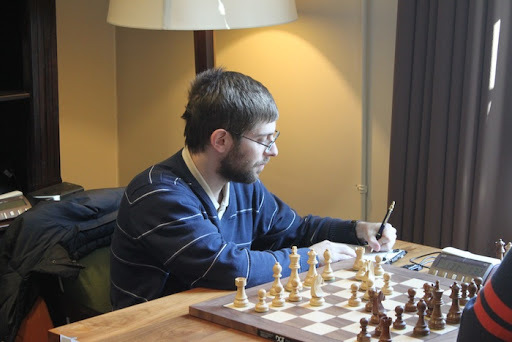 GM Boros,D(HUN) shared first with GM Meier,Geo scoring 5/6. Boros is part of the team that transfered from Texzs Tech to Webster University in St-Louis. ‘St. Louis, Feb. 3, 2012 – Building on St. Louis’ growing reputation as a world-class chess center, Webster University is making some exciting chess moves. The University today announced that chess Grandmaster Susan Polgar, World and Olympiad Champion, and her Susan Polgar Institute for Chess Excellence (SPICE), will relocate to Webster from Texas Tech University in Lubbock, Texas, on June 1, 2012. In addition, all members of the reigning national collegiate champion Texas Tech “A” chess team will transfer to Webster and be enrolled at the University in the 2012-2013 academic year. Here is his round 6 win over GM Shulman. White played the unusual plan of attacking on the queenside for a dominating strategic game. Black has just played 33…Kg7. White has the queenside under pressure but what now?